The Freedom From Religion Foundation is urging the IRS to approve a proposed rule change that would terminate a massive voucher-like tax break. 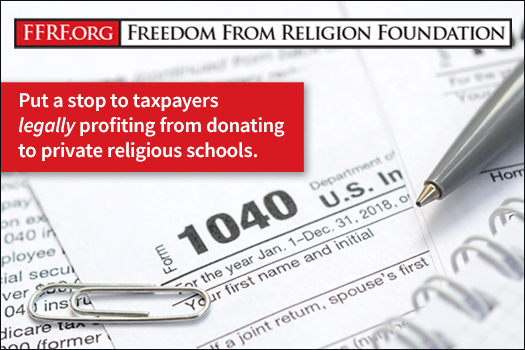 The Internal Revenue Service is seeking public comments on a rule that would, among other things, puts a stop to a widespread practice of taxpayers legally profiting by donating to private religious schools. The tax loophole works this way: First, some states provide dollar-for-dollar tax credits for donations to educational scholarship programs, which keep some of the funds for themselves and pass the rest onto private schools, most of which are religious. So, if you donate $100,000, the state takes $100,000 off of your state tax bill. Next, the federal government gives a deduction on federal taxes on the same donation. After donating $100,000 and having the state pay you back in full, you also get to deduct $100,000 from your federal taxes. The vast majority of private schools benefitting from such programs are religiously affiliated. Tuition tax credits almost entirely subsidize religious schools with overtly religious missions. For example, in North Carolina, 92 percent of students receiving public money through “opportunity scholarships” have used it to attend religious schools. Plus, this tax scheme invites fraud due to a lack of accountability. The Arizona voucher program, one of the oldest and largest, is a cautionary example. The New York Times has chronicled the shocking way Arizona State Senate President Steve Yarbrough — who pushed the tuition tax credit system in his official capacity — made money from a quintupling of the scheme through his ownership of a company that processed the vouchers. “The fact that an influential politician can both promote and profit from tax credit vouchers shows what can happen when public funding for education is largely removed from public hands,” the piece stated. And the tax write-off is an unfair break that is used to subsidize religion. “It also stretches the credulity of the term ‘donation,’” Barker and Gaylor write. “This is inappropriate and violates our country’s core principle of keeping church and state separate. That’s why FFRF is pressing the Internal Revenue Service to put into place the proposed regulation that would close this outrageous tax loophole. It would do justice to the vast majority of taxpayers — and to the U.S. Constitution. Chime in by Oct. 11 to support this federal rule change. Ax this loophole.